Our department has been involved with large campus events since 1991. 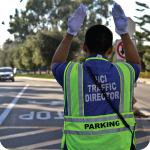 Our experienced and knowledgable staff members are eager to help facilitate your parking needs for a successful event. Contact us today to reserve the services of our helpful parking staff, including Parking Attendants and Traffic Directors. Please request staff at least two weeks in advance to avoid late fees. Parking Attendants provide a friendly welcome to your guests who are parking in any of our lots or structures. Your guests will be given permits sponsored by your event, or may purchase a parking permit directly from an attendant. Traffic Directors can also be reserved for large events. Our experienced staff will set up traffic patterns to ensure that your guests arrive and depart in a safe and efficient manner.